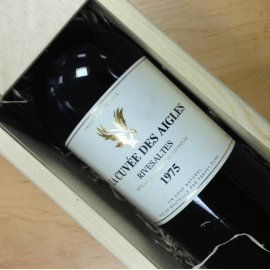 The La Cuvée des Aigles 1975 Rivesaltes does not quite deliver the complexity of the 1965 in my opinion, though it still offers attractive dried orange peel, ginger and marmalade scents, though here shrouded in some volatile acidity. The palate is better with a very attractive mandarin and marmalade opening, well balanced with good acidity, a prickle of spice towards the finish, but overall somehow gentle and soothing. If the nose can muster more nuance, then this might be better than the 1965. Pale tawny in colour with a mahogany fade at the rim. The nose is intense with dried fig, salted almonds and a light savoury spice. The palate is rich on entry with a great intensity of honeyed and dried fruit. On the mid palate this mellows into more nutty, savoury flavours. The finish is round and supple without being overly sweet. There is still a core of dried fruits on the long finish which maintains a slightly nutty, nutmeg character. Moreish and complex.